PROPERTY DESCRIPTION: Breathtaking 60+- acres of timber, pasture, lake, and improvement in the Hills of Chautauqua County, Kansas. 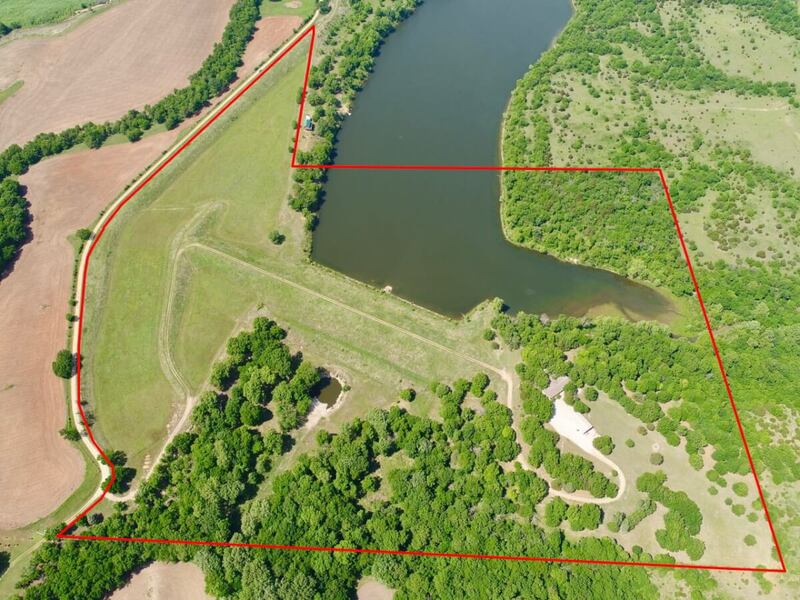 Included with the property is 11 acres of a very large Watershed Lake. In addition to that is the spillway and creek exiting the spillway area, which are well known as first class areas to fish. Both the lake and spillway provide excellent fishing for species that include Largemouth Bass, Crappie, Channel Catfish, Flathead Catfish, and Bluegill. The 11 acres of Lake Water you will own includes all of the Dam, the deep water directly along the Dam, and a secluded cove below the house. Hunting for Kansas Whitetail Deer, Turkey, and Quail is excellent. Hardwood Timber includes a combination of large mature Oak Trees, Walnut Trees, Blackjack Oak Trees, and multiple other varieties throughout the property. You will be amazed by the size of some of the mature trees on the property. This secluded property is very private, located at the end of a dead end road. IMPROVEMENTS: This beautiful well built brick home was built in 1999 with 2860 square feet of finished living area, and has 2/3 Bedrooms and 2 Full Bathrooms. The Kitchen is Huge!! Plenty of space to entertain guests with a large L shaped Great Room/Living Room area. Enjoy relaxing in the enclosed patio area overlooking the Lake, or step outside to the deck and outdoor fireplace with cooking station. Both of the large main bedrooms have direct access to a full bathroom, and there is an additional room currently being utilized as a 3rd bedroom. Storage in the house is abundant with two large separate storage rooms for food, supplies, and gear for hunting, fishing, and camping. The house is all electric, has rural water, septic system, and Central Heat & Air. Extra storage for equipment, vehicles, and “toys” is provided by a 1500 square foot wood frame building w/ metal siding and a concrete floor. The building is wired and has 3 overhead doors in addition to the walk-through door. LAND LOCATION: From HWY 160 at Grenola Kansas, South on Road 6 (Main St) 5 Miles to Union Rd, West 1/2 Mile to Road 5, South 1 Mile to the property. LEGAL DESCRIPTION: Long legal, contact Sundgren Realty Inc. for details. 2017 REAL ESTATE TAXES: $3281.82. TERMS: Earnest money required is $25,000 due at the conclusion of the Auction with the balance due upon Sellers submission of merchantable title and closing. There will be a 10% buyers premium added to the high bid to determine the contract price. Closing date shall be on or before July 30, 2018. Closing fee and title Insurance fee will be split 50/50 between Seller and Buyer. Selling subject to easements, restrictions, roadways and rights of way. This property is not selling subject to financing or inspections. Interested buyers need to view the property prior to the date of the auction and have financing available and any inspections performed prior to bidding. All pertinent information is available upon request. All announcements made the day of the auction take precedence over any other announcements or printed material.